Welcome to the projects section of the AeroSwine blog. Before I had this web space i had my crafts. Some are weird some are fun. 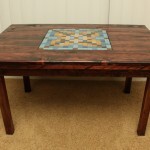 I build furniture with a twist, and I re-purpose old electronics for new uses or just use their cases for new things. Anyway this projects section is for me to show off my work on my cars, the furniture i build, and any of the small or large projects of new or old I have taken up in my spare time.